AJ Ross has the story from Glendale. WILLIAMSBURG, N.Y. -- A man reportedly showed up at a fight with his teenage daughter, then joined in, hitting other girls involved in the melee. 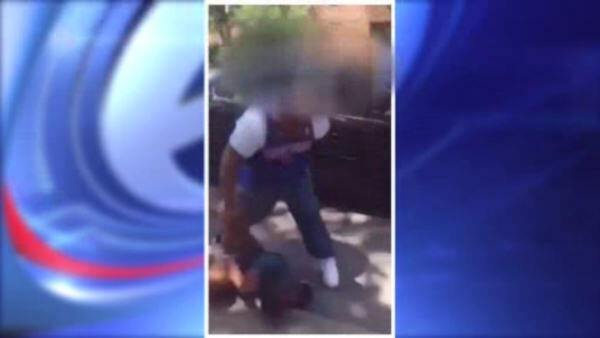 The fight occurred this past week in Williamsburg and now the NYPD is investigating. The vicious fight was captured on cell phone video Thursday afternoon. 16-year-old Alexandra Pineiro says she was with friends in Williamsburg, when she was approached by another 14-year-old girl she had a previous fight with. The teen did not come alone, and says the other girl's father not only tagged along, but encouraged them to fight. Shortly after the fight started, the father jumped in. A father jumped into a fight with teenage girls in Brooklyn, and started to throw punches. The man, who is described as over 6 feet tall, weighing nearly 300 pounds repeatedly lashed out at Alexandra and several other girls who tried to break up the fight. Alexandra has cuts, scrapes, and bruises all over her body, and her mother has filed a report with the police. "We started fighting from then, and I don't know, her father was trying to break it up in the beginning, and then he started hitting me, started choking me, pulling my hair, pushing me over the fence, I guess trying to let her win," Alexandra says, "and then my friends jumped in to defend me, and he started swinging at everyone else." "When I got to the scene, I saw the ambulance - she had blood all over her face because all of her nails came out, and she was bleeding through her face and through her arms," said the victim's mother, Alexandra Pena Velez, "my reaction? What's going to happen now, because he didn't get arrested - he hasn't gotten arrested yet. This fight is now being investigated by the 90th Precinct Detective Squad. Anyone with information is asked to call police.